I first met Aphra over three years ago at a craft fair in Silver Spring, MD. At the time she designed and made clothes. Over the years, I've met many vendors and some interactions stick with you. I remember our interaction and over the years it has been a joy to watch Aphra iterate over and over, constantly evolving. 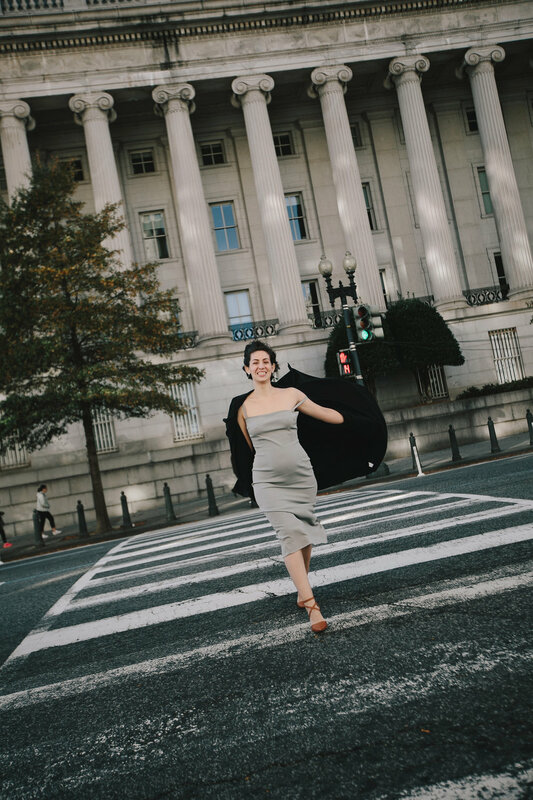 From her own line, to curating a clothing and home decor boutique, to running operations for Sally's Middle Name (named to Washingtonian's 100 Best Restaurants 2017. a must eat/drink spot. go go go) alongside her husband and a team of dedicated staff, Aphra's creativity and abilities express themselves in a multitude of ways. She is also a mom and she and her husband, Sam, are expecting their second baby this year. Effortlessly poised, ready with a warm expression, wisecrack or bit of wisdom, Aphra's quiet strength and honesty are qualities we want to celebrate and encourage in one another. In addition, her sensibility for local sourcing, taste for good food, emphasis on gathering around the table, and creativity in activating the upstairs of Sally's for events and co-working space (home to co-working collective Locale Workspace), are all reasons why we named her a force of taste. I hope you enjoy learning more about this amazing lady and come to find common ground and your own force in her story. You are a wife and mother, maker, restaurant operator - to name a few. How do you find centering and balance? In the routine of home. Sunday is the only day we get to spend together as a family, and every Sunday night we have dinner at my Godparents' house. It's a place that's been home my entire life (which has always been hectic). Sometimes visiting family or friends are also there; sometimes it's a big elaborate meal, and sometimes it's take-out from around the corner. But the comfort and familiarity of the space and the people always leave me feeling grounded and ready for whatever the coming week has in store. What is different about you today than in the beginning of the year? At the beginning of the year, I was still clinging to a certain expectation of the timeline and path of my life. Today I am (a little bit) more accepting of the fact that I don't know yet where my life is going. I'm only 28, there are a lot of things that are still unknown. I didn't expect to be pregnant with my second child by the end of the year, and yet here we are! When faced with a challenging situation, what is the first thing you do? Then, what's the second? The first thing I do is ask myself "What's the worst that could happen?" if this fails or doesn't end the way I want it to. Then I usually make a step by step list of what I need to do to overcome the situation and who I can ask to help me. Throughout any challenge I am usually also texting my sister every 5 minutes for advice and comfort. What is a piece of advice for keeping the spark alive and connection strong in a longterm relationship? Don't be afraid of confrontation or change. Find joy in rediscovering the person you're with, because chances are neither of you are the same person you were a year ago (five years ago, ten years ago). I've had moments of fear and frustration when I've expected my husband to be someone he isn't anymore. Stepping back from the situation to ask "Who are you? What are the things you want/like/dislike/need?" of him and of myself gets us through almost every major conflict. Who is a force in your life and why (positive or negative)? My family. They are the hardest workers I've ever met. Seda Nak. It was an unexpected friendship but one I don't know how I ever lived without. She is an invaluable sounding board and a fiercely loyal person. My son. He forces me to be the best version of myself no matter the situation. When you are at your most alive/powerful, you __________________. Try and share that feeling as much as possible. Usually by baking something for someone. What are your favorite foods and smells right now? Pancakes hot off of the stove with warm strawberry jam and a big dollop of cold yogurt. And generous side of breakfast sausage. If I had to choose a single quality, it would be my ability to find humor in almost any situation. Of course I feel stress and anger like everyone else, but being able to laugh through those moments makes life feel a lot more worth living. Make sure you're following us on Instagram to see more posts and highlights from her story this week. Posted on November 28, 2017 by Sarah Bayot and tagged forceof forceoftaste taste kicheko kichekogoods lifewithkicheko. Today is International Women's Day and every year on this day is an opportunity to rally together and invite everyone to celebrate the women in our lives and across the world. On this day, we recognize the passion, intelligence, strength, compassion, resilience and inner beauty that make women a formidable force - one that brings incalculable value, nuance, balance, structure, and cohesion to our companies, organizations, homes, schools and small businesses. Here at Kicheko, we want to provide hope and a brighter future to both boys and girls. Mango Tree School is our first partner school and an educational institution that educates over 200 students in eastern DR Congo. Through a grant administered and managed by Mango Tree School's leadership, Kicheko supports the costs of tuition and attending primary school to over 71 students in Mango Tree School, who have varying levels of financial and circumstantial need. While progress is happening, approximately 7 million Congolese children are out of school - with an estimated 53% of this number being girls. The disparity gap in literacy rates remains substantial with approximately 79% of boys ages 15-24 able to read whereas girls in the same age range remain at an estimated 53%. That is why we are privileged to partner with Mango Tree School in their goals of bridging the gaps to provide safe, quality and consistent education to this future generation. Mango Tree School also engages with families in the community and employs both male and female teachers and staff, providing much-needed jobs to a post-conflict area in need of development, governance, and investment. We can all do something. Start by recognizing and celebrating the women in your life and begin to draw the circle out and around. Who are the women in your workplace and communities that propel all of us forward? Who are the women around the world you admire and inspire? Take moments today offline and online to write encouraging notes, letting them know we're all in this together and that you appreciate them. Posted on March 8, 2016 by Sarah Bayot and tagged iwd2016 internationalwomensday internationalwomenday pledgeforparity #genderequality #socialimpact #socent #education #drc #drcongo #socialgood. From earthy textures to sunset hues, Kicheko's new pieces are inspired by the colors and warmth of spring and we are excited to share that these pieces are now for sale on TOMS Marketplace. With two new necklaces and a pair of druzy earrings, this batch is composed of the Soleil necklace, Queensland Arrow necklace and Prism Aura Druzy Studs. Learn more about the collection below! A statement necklace that gives off vibes for the sun, beach and outdoors, this necklace is made out of agate and quartz in a unique color matrix that gives the wearer a truly distinctive piece. Edged in gold-plate and set with a matte gold-plate brass bar, the Soleil is set on 14kt gold-filled chain. A beautiful stone of royal and historical significance, this necklace is made of bright and deep green chrysoprase edged in gold-plate. No two stones are alike as each piece is fashioned uniquely from specific raw material. An elegant statement piece, the Queensland is set on 14kt gold-filled chain. Brilliant in color with a naturally velvet texture, the Prism Aura Druzy Studs feature tiny crystals that have grown slowly over millions of years on top of quartz stone. Finished and refined with a layer of titanium on the outside, these studs are beautiful additions to your accessories line. Stones are set on stainless steel posts and earnuts. As spring draws even closer, the warmth, greens and flora of the season will inspire a season change of wardrobe and accessories. Think of us as you edit your wardrobes and curate for the sunnier temperatures. Remember, each purchase sends one child to school for one month in eastern Congo. We can't wait to see how you style your new Kicheko pieces. Tag us @kichekogoods and use #kichekostyle. Shop your new looks and the sale on TOMS Marketplace. Posted on March 1, 2016 by Sarah Bayot and filed under Maven Style and tagged kichekogoods kicheko toms tomsmarketplace marketplace jewelry jewelryforgood quartz agate necklaces earrings druzy studs prism kichekowoman kichekostyle sociallyconscious socent shoplocal shopgood spring season. Today we're giving thanks for community and the gift of friendship. This year has been a stretch year for sure - one of growth and amazing opportunities that have humbled us and given refreshed vision for why we do this. Really grateful. The energy and current that keeps us going is the incredible community of individuals that have become a part of this dream and helped build it along. Your faith, friendship, hours, encouragement and jokes mean so much. To our friends in eastern Congo at Mango Tree School, we are so grateful to you for sharing your lives, hopes and cares with us. You give us a glimpse of the great, big world around us and show us that we are all a part of something bigger than ourselves. We will continue to share your story with our best and partner to make education a reality to the children that enter your doors. Friends, we wish you a very happy thanksgiving and a day full of gratitudes. Posted on November 26, 2015 by Sarah Bayot and tagged thanksgiving grateful gratitude givethanks. This week we would like to introduce you to one of our newest TOMS Marketplace partners Kicheko Goods. Kicheko is a socially conscious brand that designs and makes distinct pieces that invest in education. Each purchase of a Kicheko Goods product sends one child in eastern Congo to school for one month. Read on for the full Q&A in the words of the founder Sarah Bayot. TOMS: How did the idea for Kicheko come about? Kicheko: I began making jewelry in 2012, primarily simple and functional pieces like fabric covered studs. Since I wore my earrings on a daily basis, friends and coworkers began asking to buy pairs and I found myself after work and on weekends fulfilling orders. The business didn’t have a name at the time, but I was keen on dedicating a portion of the proceeds to help with community development efforts in DR Congo. Once I honed in on this model, my friends served as my focus group to vet names and the consensus landed on Kicheko, a Swahili word describing smiling/laughter. TOMS: Can you tell us more about Kicheko’s mission? Kicheko: I have worked with a locally led community in eastern Congo for five years and in 2014, I helped the community raise funds to construct a primary school called Mango Tree. What we discovered is that most families can afford to pay school fees for at least some months out of the full academic year. However, for the remaining months when they cannot afford school fees, their kids fall behind and that gap in their education causes them to repeat the same grade the next year. We seek to eliminate the education gaps by providing student scholarships to supplement the costs of attending school. To date, Mango Tree educates over 200 students and we are excited to expand our partnerships in the next couple years so we can extend opportunities to more students. TOMS: Why is giving back through business so important to you? Kicheko: We are committed to building a company that sees aesthetic and impact as equal partners. Education strikes a chord in me because it’s such an empowering vehicle. Our kids in Congo also have helped me realize the transformative effects education can have on a young mind, in a social group, in a community, in a village and beyond. These kids value learning so much and do not take it for granted. In Congo, there are so many things that can change from day to day. However, one thing that cannot be taken away is education. Once you have it, you have it for life. TOMS: What is something that’s surprised you as a social good business owner? Kicheko: Something that has surprised me is that while there are tomes of advice on building and running a business, the “special sauce” is actually something very personal and unique to each business. That special sauce is the personal journey of discovering the field, medium and social issues you care enough about to want to create something because the status quo is not quite enough. You also learn so much about yourself during this process. But if you care strongly about something, you are willing to continually learn and grow, you celebrate the wins and take moments to enjoy the milestones with others—it’s an amazing process. There’s nothing quite like it. TOMS: What inspired the products we’re featuring in TOMS Marketplace this holiday season? Kicheko: One of the staple materials I work with is natural stone, particularly quartz. All of the pieces are made of druzy quartz interpreted in various forms. I love quartz because it’s a prolific mineral found in the earth’s continental crust. Trace amounts of minerals, gases or liquids that combine with the crystal create these beautiful colors and effects on the mineral’s structure. I enjoy sourcing pieces that represent these unique relationships in nature taking place. TOMS: What Kicheko piece are you most excited about sharing with the TOMS community? Kicheko: I am most excited about the druzy studs collection. It’s a line of beautiful pieces that can dress up a t-shirt and jeans outfit, but also rock with a dressier ensemble. The druzy effect radiates uniquely depending on the natural or artificial light levels. The blue midnight and purple aura are deep and gorgeous colorways for adventurous color lovers, while the gold and rose gold are perfect for a classic, elegant look. Posted on October 12, 2015 by Sarah Bayot and tagged toms marketplace holiday collection druzy quartz oneforone socialgood.